RIT’s history is captivating and eclectic. The university started with a progressive vision and uncommon ambition. RIT was born of an unlikely institutional marriage of an influential cultural association, the Rochester Athenaeum, founded in 1829, and a technical training school, the Mechanics Institute, founded in 1885. The institute adopted the name Rochester Institute of Technology in 1944 and awarded its first bachelor of science degree in 1955. 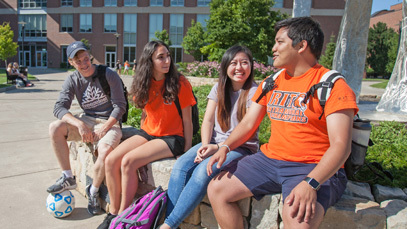 A 1961 decision to leave downtown Rochester for farmland in the suburban town of Henrietta put RIT on its path to pre-eminence as a global university. Today, the university’s reputation and reach go well beyond Rochester. We have partnerships on nearly every continent and overseas campuses located in China, Croatia, Dubai, and Kosovo. Colonel Nathaniel Rochester and other community leaders establish the Rochester Athenaeum, an association “for the purpose of cultivating and promoting literature, science, and the arts.” The Athenaeum offers public lectures and debates, and begins establishing a substantial library. It grows into a popular cultural center. The Athenaeum merges with the Mechanics Literary Association, founded in 1836 by William A. Reynolds, to form the Rochester Athenaeum and Mechanics Association. 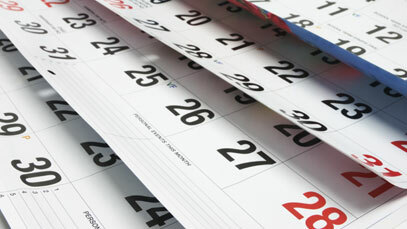 It continues the tradition of public lectures, book reviews, and debates. The two groups merge their literary collections to create a singular library of more than 8,000 volumes. Lectures include distinguished speakers such as Charles Dickens, Ralph Waldo Emerson, Oliver Wendell Holmes, and Frederick Douglass. Mechanics Institute is established by Captain Henry Lomb, Max Lowenthal, Ezra Andrews, Frank Ritter, William Peck, and other Rochester businessmen and influential citizens. The school provides needed technical training for skilled workers in industry. All funds for running the school are donated by the citizens of Rochester and instruction is free for the first year. The first class offered at the newly formed Mechanics Institute is mechanical drawing. The Eastman Building opens on Plymouth Avenue and the Erie Canal Aqueduct. George Eastman, founder of Eastman Kodak Co., donates the funds for this building and is an active benefactor of the institute until his death in 1932. Our first president, Carleton B. Gibson, is appointed. He serves until 1916. James Barker was asked to be the Mechanics Institute’s second president in 1916. He was an engineering graduate from Cornell University and believed in emphasizing technical training. Barker’s main interest was the promotion of secondary education. He remained in the position until 1919, when he resigned in order to take a position with the Rochester City School System. Royal B. Farnum assumed the presidency of the institute in 1919. Between 1919 and 1921, more students enrolled at the institute than ever before. This was primarily due to the school’s appeal as an intermediary place of instruction between high school and college-level education. Fundraising efforts carried out during his term allowed the school to remain financially stable. The institute waited for a period of nine months before appointing John Randall as Farnum’s successor. Randall was invited to be president in 1922. He had served as the undersecretary to the secretary of war for the United States. He had taught at Pratt Institute, where he was head of the physics department, and at Cheltenham Military School in Pennsylvania. Randall and Carl Lomb engaged in a series of conferences that would benefit the institute’s future. It was eventually decided that the role of the institute was to provide short, intensive courses and not to award degrees. Mark Ellingson’s career at the institute began as a teacher. During his term as president, the institute was able to increase the endowment from $1.5 million in 1937 to $20.8 million three years later. An important merger between the Empire School of Printing and the Mechanics Institute took place in 1937. In 1944, the Rochester Athenaeum and Mechanics Institute was renamed Rochester Institute of Technology. During Ellingson’s presidency, RIT revised its decision regarding awarding degrees. Under Ellingson’s direction, the university began planning for the Henrietta campus in 1961. When Paul Miller began his term in 1969, the campus had just moved to Henrietta. Miller introduced a budgeting procedure to RIT that focused on simply not spending more money than the university had available and allocating funds as they were deemed necessary. Enrollment increased at a steady pace from 1969 to 1981 due to the increasing likelihood of college-level studies leading to a professional job. M. Richard Rose assumed the presidency on January 1, 1979. Miller and Rose shared the belief that students in a technical school should be exposed to more art, literature, philosophy, and culture. Partially out of this interest, and partially due to financial difficulties, Eisenhower College became a part of RIT. The university had made attempts to increase the liberal arts and humanities curriculum. Rose helped launch RIT’s first Ph.D. program, in imaging science, in 1988. Albert Simone was inaugurated president in 1992. 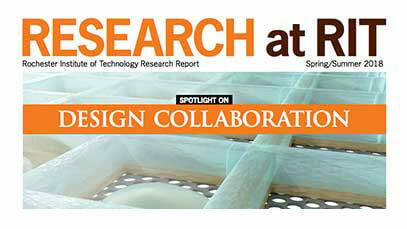 Under his direction, partnerships with business, industry, and other professions have led to RIT’s continued success. Simone helped launch Ph.D. programs in microsystems engineering (2002), computing and information sciences (2005), and color science (2007). He also spearheaded the addition of the Gordon Field House and Activities Center and approved RIT’s move to Division I men’s hockey. William W. Destler became RIT’s 9th president on July 1. He was formerly senior vice president for academic affairs and provost of the University of Maryland at College Park. 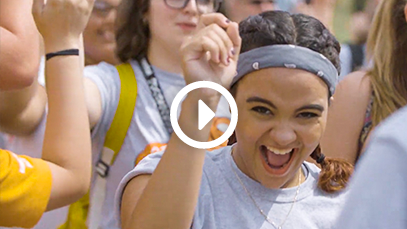 He had a vision to take RIT to the next level by transforming it into the nation’s first “Innovation University.” RIT’s annual Imagine RIT: Creativity and Innovation Festival was also Destler's idea. David C. Munson Jr. became RIT’s 10th president on July 1, 2017. He was formerly dean of the University of Michigan College of Engineering. He has a vision to build RIT’s research and graduate programs; focus on the intersection of technology, the arts and design; and produce graduates who lead lives of consequence and purpose. The cooperative education program is started by President Gibson. Students find positions in industry and gain valuable, practical work experience before they graduate. At the time students worked in stores, factories, restaurants, and hospital kitchens. Four-year cooperative retail distribution program started. A course in industrial chemistry started. Empire State School of Printing (now the School of Media Sciences) is acquired through the efforts of Frank Gannett. Classes are offered all day and all night to train thousands for jobs in the defense industry. The institute’s Evening School opens to women to assist in the war effort. The institute adopts the name Rochester Institute of Technology. The Graphic Arts Research Center is established to “apply scientific and engineering principles to the printing and publishing industry.” RIT is a center of research on all aspects of the graphic arts. The School for American Craftsmen (now the School for American Crafts) moves to RIT from Alfred University. It was founded by Aileen Osborn Webb and associated with Dartmouth College briefly before moving for three years to Alfred. The first bachelor of science degrees awarded. The first master’s degrees are awarded (all master of fine arts degrees). Edwina Hogadone is appointed the first dean of the College of Business. Starting at RIT as a teacher of salesmanship, personnel, and merchandising in 1931, she is the first female dean at RIT and first woman in the nation named to head a college of business. The institute makes the decision to move from downtown Rochester to a new location. Land in Henrietta, N.Y., is purchased and construction on a new campus begins in 1964. The College of Science is established. RIT is chosen as the home campus for the federally sponsored National Technical Institute for the Deaf, which had been established in 1963 by Public Law 89-36 and signed by President Lyndon B. Johnson. RIT moves to its new campus in Henrietta. The Dedication Ceremony takes place during Homecoming Weekend in October 1968. RIT offers graduate engineering course work via closed-circuit TV at local factories. The College of Engineering is established. The School of Computer Science and Technology is established. The RIT Distance Learning program is created. 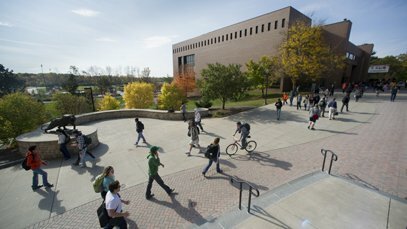 The Eisenhower College is acquired by RIT. The RIT Research Corporation is formed to provide opportunities for collaborative projects with industry and government in imaging and information processing. The microelectronic engineering program is established. The program is the first undergraduate program in the field in the U.S.
A program in biotechnology begins. The Center for Microelectronic and Computer Engineering is dedicated. The facility serves as a center for undergraduate education and research in the design and fabrication of integrated circuits. The Chester F. Carlson Center for Imaging Science is dedicated. The building houses the new program in imaging science. RIT’s first Ph.D. program is established. The program, in Imaging Science, is the first Ph.D. program of its kind in the U.S.
RIT offers full degree programs online. An undergraduate program in software engineering, the first of its kind in the U.S., is established. The Center for Integrated Manufacturing Studies, created with $20.75 million in federal and state funding, opens with a mission to increase the competitiveness of manufacturers through technology solutions and training. The American College of Management and Technology opens in Dubrovnik, Republic of Croatia. ACMT is a collaborative effort between RIT’s College of Applied Science and Technology and Velecillste Dubovnikú, the Polytechnic of Dubrovnik. The Golisano College of Computing and Information Sciences is formed. The new college includes programs in computer science, information technology, and software engineering. New bachelor of science and master of science programs in bioinformatics are created. The new programs merge biotechnology and information technology. A Ph.D. program in microsystems engineering, the first in the country, is established. The program is part of the Kate Gleason College of Engineering. The College of Applied Science and Technology (now the College of Engineering Technology) establishes a new program in collaboration with the American University Foundation in Kosovo. Students pursue course work in various subjects, including service management, business development, economics, and marketing. The Gordon Field House and Activities Center opens. The 160,000-square-foot facility includes an aquatics center, a two-story fitness center, and a 60,000-square-foot multi-use arena and indoor athletic field. RIT announces that the men’s hockey program will join the Division I Atlantic Hockey Association. The move to Atlantic Hockey will be phased in over three years, with Division I games starting in 2005. 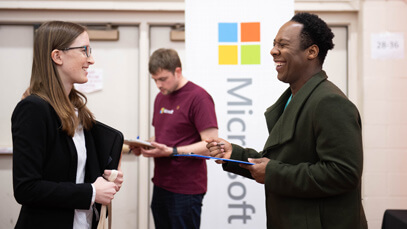 A Ph.D. program in computing and information sciences is launched by the Golisano College of Computing and Information Sciences. 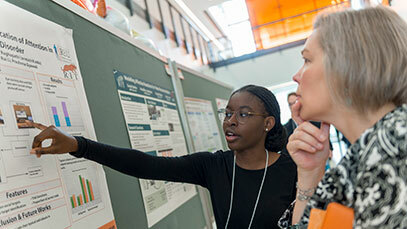 This marks RIT’s third Ph.D. program. RIT launches a Ph.D. degree program in color science, the first in the world. The Golisano Institute for Sustainability is established at RIT with a founding commitment of $10 million from RIT Trustee B. Thomas Golisano, founder and chairman of Paychex Inc.
RIT opens a campus in Dubai, United Arab Emirates. Funded by the Dubai government, RIT Dubai is part of Dubai Silicon Oasis. 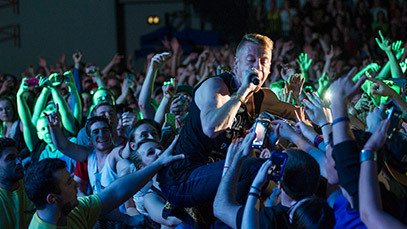 RIT provides academic content, leadership and management of the university. 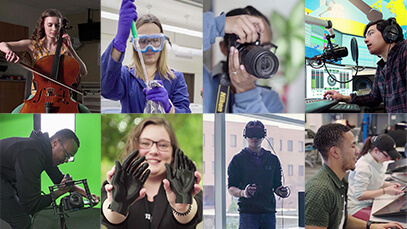 The first Imagine RIT: Creativity and Innovation Festival draws more than 15,000 visitors to campus to see more than 400 interactive exhibits and displays, including new ideas for products and services, creative arts and crafts, and faculty and student research. The College of Science launches a doctoral degree program in astrophysical sciences and technology. The Golisano Institute for Sustainability creates the world’s first Ph.D. program focused on sustainable production. RIT and Rochester Regional Health begin a strategic alliance. The RIT men’s hockey team catapults into the national spotlight by earning a trip to the NCAA’s prestigious Frozen Four. The team’s surprising success (a program with no athletic scholarships and only Division I for five years) brings new pride to Tiger fans across the globe. The iconic work of international designers Massimo and Lella Vignelli is permanently archived at a new design center, the Vignelli Center for Design Studies. The Vignellis created the New York City subway signage, the Handkerchief Chair, the Paper Clip Table, the Stendig calendar, the interior of St. Peter’s Lutheran Church in New York City, the corporate identity programs for Xerox, American Airlines, and packaging programs for Bloomingdales and Saks Fifth Avenue. The university breaks ground on a state-of-the-art “green” facility for its Golisano Institute for Sustainability. The building will serve as a center for sustainability research, technology transfer, education and outreach and will provide a showcase for green construction and design. The women's hockey team wins the Division III NCAA national championship and also announces it will move up to the Division I level. The Golisano Institute for Sustainability, which houses one of the world’s first Ph.D. programs in sustainability, opens its doors to its new building. The institute conducts cutting-edge research in nanotechnology, alternative energy development and sustainable design. It is one of the greenest buildings in the world, powered by the sun, wind and fuel cell technology. Sebastian and Lenore Rosica Hall opens at NTID. This space will serve as an innovation and research hub for NTID. The Gene Polisseni Center, home to men’s and women’s hockey, opens with a roar. The $38 million ice arena has capacity for 4,300 Tiger fans. 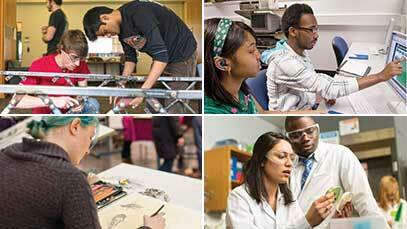 RIT launches its seventh doctoral program, a Ph.D. in engineering. The university receives approval for its eighth doctoral program, a Ph.D. in mathematical modeling. Dr. David C. Munson Jr. is named RIT’s 10th president, succeeding Bill Destler, who retired after 10 years of service. Dr. Munson is the former dean of the University of Michigan’s College of Engineering. MAGIC Spell Studios—a hub for digital media, game development, film and animation, sound engineering—opens its 52,000-square-foot facility. The studio—the only one of its kind in the Northeast—boasts the latest in technology and design, rivaling media production studios in New York City and Hollywood.